To see an amazing, zoom-able picture of this Nebula go here! The Orion Nebula is 1,500 light years away (8,817,749,721,315,000 miles away)! The Orion nebula is located near the bottom of the Orion constellation. The Orion constellation contains five stars and Betelgeuse is the most popular of the bunch. You can see Betelgeuse in the top, red circle. Near the bottom of the Orion constellation you can see a red circle, this marks the area the Orion nebula exists. With a moderate telescope you can see the Orion nebula fairly easy as long as you locate the Orion constellation. 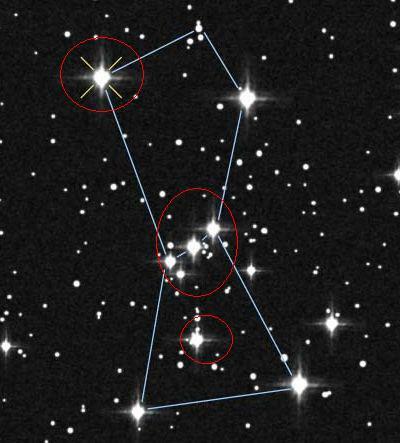 I found that the easy way to spot the Orion constellation was to find the belt of the constellation (the middle circle). Unfortunately, this nebula has been used to try and find a “re-enactment” of the evolutionary view of our early solar system. Of course, nothing has been found, no proof, or anything. Just another pawn in the Evolutionists hand that turned out to be a dead one. The reason for the Evolutionists interest in this nebula is because over 150 protoplanetary disks have been found. This disks are suspected to be the beginning of solar systems that will develop planets, moons and, at least to the Evolutionist’s hopes, life. This will never happen because God is done creating. I was utterly shocked when I first saw that zoom-able picture of this nebula, and I’m still amazed at the beauty God has created!